VR Group is wholly owned by the State of Finland. The Government Ownership Steering Department of the Prime Minister's Office wields ownership power in the Group. Rail traffic is comprehensively regulated. In early 2013, the EU Commission presented a proposal for the fourth railway package, which contains a total of six legislative proposals. The aim of the Commission is to create a unified European railway area, to remove technical and administrative obstacles and to open domestic passenger rail services to competition. Discussion on the package in EU institutions is still continuing. Every VR Track contract is acquired through competitive tendering. Competition has intensified due to the downturn in the infrastructure sector. VR Transpoint has a large number of competitors in the logistics business, and in rail traffic the first competitors have already started operations. Railway transports continue actively between Finland and Russia, as they utilise the same track gauge. A third of the freight traffic in Finland involves traffic to and from Russia. The new Finnish-Russian Railway Traffic Agreement opens Eastern freight traffic to competition during 2016. There are five daily passenger train connections between the countries. Developments in Russia’s economy greatly affect VR Group’s business operations. The weakening of the rouble has decreased Russian travel to Finland, and this can also be seen in the passenger numbers for Allegro trains. VR is preparing for competition in passenger services. Even though VR still has the exclusive right to operate rail passenger services until 2024, trains are in continuous competition with other modes of transport, particularly buses, coaches and private motoring. The increased competition in public transport has reduced average ticket prices and the net sales of VR’s long-distance traffic. In the autumn of 2015, the Ministry of Transport and Communications stated that it intends to accelerate opening the country’s rail passenger services to competition. A more detailed proposal is expected to be released in spring 2016. The prerequisites for opening rail services to competition in Finland have been in preparation for several years. In 1995, track maintenance and traffic management were separated when the control of the railway network was transferred to the state agency (previously the Finnish Rail Administration, now the Finnish Transport Agency) and VR-Group Ltd was established. Training for the railway sector moved from VR Group to the Kouvola Region Vocational College at the beginning of 2014. Finrail Oy, a commercial company providing rail traffic control, passenger information and planning services, started operations as an independent state-owned company in January 2015. Services purchased by Helsinki Region Transport (HSL) account for about half of all net sales for commuter rail services. VR and HSL have signed a new agreement on commuter traffic operations that lasts until summer 2021 and replaces the agreement that would have lasted until the end of 2017. The structure of the new agreement enables smooth tendering in commuter traffic. At the same time, it will provide HSL with over EUR 30 million in savings for the agreement period. The preparation work for competitive tendering in commuter traffic continues, and HSL aims to provide clear guidelines for competitive tendering by 2018. Finland's rail network is the responsibility of its owner, the Finnish Transport Agency, which receives its funding from the state budget. 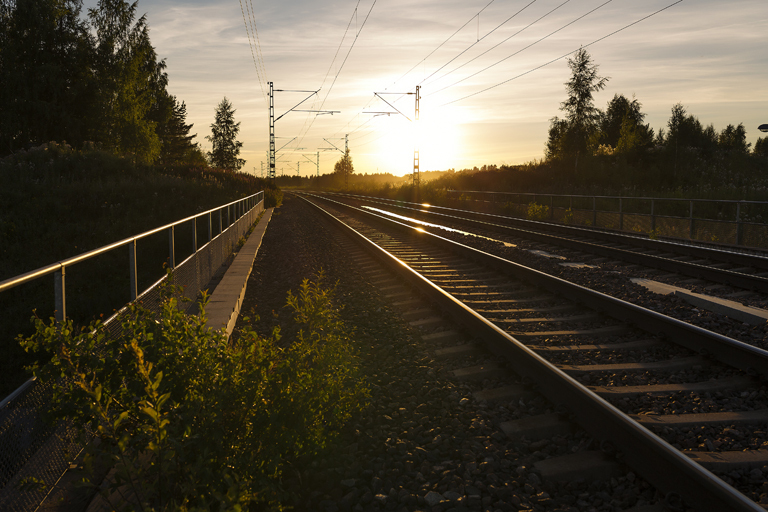 The appropriations of the Finnish Transport Agency determine the volume of track construction and maintenance and the volume of the engineering market. The Finnish Transport Agency is also the biggest customer of VR Track. Lowered public finances also mean a decrease in funding for the development of infrastructure. Higher volumes and improvements in speeds and punctuality are only possible if the rail network is in good shape. The continuing increase in the maintenance backlog has been worrying from the perspective of traffic management. Aging bridges, other structures or electric and safety equipment also cause traffic restrictions. The maintenance backlog of the railway network is estimated to be around EUR 1.2 billion. According to the Government programme, the State has decided to invest an additional EUR 600 million into decreasing the maintenance backlog of transport routes, of which EUR 220 million will be directed towards the railway network. Digitalisation has changed the behaviour and service expectations of both companies and consumers. Examples of development in digital services can be found in all of the Group’s business operations. VR ticket purchases are now mainly made electronically. In freight traffic, information is transferred electronically with RFID tags as well as driver terminals. Machine control increases the efficiency and quality of infrastructure engineering. According to customer surveys, customers expect more and more diverse digital services. They are at the forefront of every business operation’s development work. Climate change affects the operating environment of all companies. Carbon emissions and global warming must be restrained urgently, which increases demand for energy-efficient and carbon neutral transports and other services. The environmental friendliness of railway services provides a great deal of business opportunities. The international climate conference in Paris accelerated international climate policies. Achieving its goals required big changes in production structures and energy use. Specific practical effects on e.g. the traffic system and legislation cannot be estimated yet.